It’s difficult to know what to say about Howl! The exclamation mark-adorned show is one half of the Lyric Theatre’s Christmas season and tells the story of a small mediocre drama group creating a mediocre show to perform at Christmas. Taking a strong swipe at luvvie stereotypes, the cast of five spend the first half of the play brainstorming, workshopping, facilitating, ad libbing and eventually agreeing to stage Little Red Riding Hood. In the second half they rehearse and finally perform the première of their new show. But amongst the sweat and angst, each character has a demon. Writer/director/producer/wardrobe mistress Patrick (played by Conor Grimes) is a recovering alcoholic (in the West Wing Leo McGarry sense that alcoholics are never fully cured) with an eye for a pretty young girl. His old friend Johnny (Alan McKee) is a low-ranking celebrity actor no longer about to get TV parts playing doctors and with a massive fear of going back on-stage. Dex (Ciaran Nolan) may be the show’s composer, but he’s got more sense of direction than musicality – and he gets lost every fifteen minutes throughout the show – and a magic mushroom addition that the St George’s Farmers’ Market won’t be able to help. Jackie (Doireann McKenna) is straight out of drama school, new to the trade and how good looks make her vulnerable to lecherous men. While Siobhan (Maria Connolly) is Patrick’s ex-wife and has fallen from glam weathergirl to spandex nutcase. The danger is that the audience sitting in the Elmwood Hall start to believe that the real cast are as bad as the parts they play. To pull off the lacklustre roles with consistency must require considerable talent. Yet the performance felt more like a good festival gig or a lunchtime show than a Lyric theatre production. Other than the superb song and dance routines – the safety announcement at the start is worked into a great Michael Jackson Thriller tribute – it’s only in the second half that the cast seemed to really shine. Whether acting as the hypnotised producer – regressed back to his seven year old self and unable to return – sitting on a stool at the side of the stage holding his blue helium balloon, or loosing his temper with the cast, or under the influence of the devil’s buttermilk, Grimes got the best lines and laughs playing Patrick in the second half. While the Elmwood Hall may not be a “proper theatre”, the show made great use of every door in the building as well as the simple but effective set. It was a shame that at times the background music and effects drowned out the on-stage unamplified dialogue. 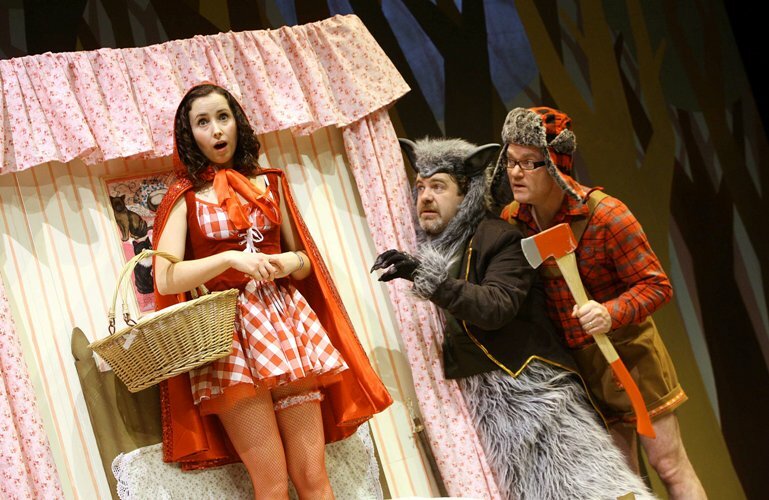 The play is well constructed, and even without children present the adult audience threw themselves into the pantomime chanting. Shergar the magical unicorn made an appearance. Like much of the show, the ending was unpredictable and unexpected. The final song – “Rockin’ around the woodcutter’s corpse” – was brilliant. It would be cheap and terribly unfair to say that the same line sums up Howl! But it is clearly a million miles away from the quality and humour of the only other stage show I’ve seen Conor and Grimes in – their classic collaboration with Martin Lynch The History of the Troubles (Accordin' to My Da). I went in expecting to be left rolling in the aisle with laughter and my sides to be hurting: but it didn’t come to pass. Howl!’s 6pm show on Saturday night played to an audience of a hundred or so and it took a while for them to warm up. Most people’s second drink at the interval seemed to do no harm in generating much looser laughter for the funnier material towards the end. I suspect the fuller 9pm show will have had a better atmosphere and been better received. It’s not great theatre and I suspect it will be quickly forgotten, but it outclasses the locally written and produced town pantomimes I remember sitting through in the local technical college. If you’ve been to see it and appreciated it more – or less – than I did, please do leave a comment below and share your thoughts. 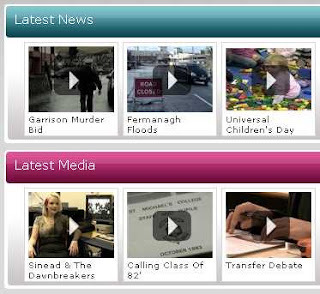 Northern Ireland's exclusion from Digital Britain's proposed Independently Funded News Consortia (IFNCs). What do you mean you don't have 40 minutes to spare to watch me, Mick Fealty of Slugger O'Toole and Gary McKeown mouth off about issues on which our knowledge is both superficial and stupendously elevating? Remember the talk in September about Lisburn having an ice rink over the Christmas holidays? Well it looks like it’s going ahead and the Visit Lisburn website is promoting the “fantastic entertainment at this enchanting undercover ice rink” in Castle Gardens. Running from Friday 11 December until Sunday 3 January, charging £5/adult (18 and over), £4/child (6–17 16 years old and Senior Citizens) and £16 for family groups of up to two adults and three children. Under 8s must be accompanied by an adult. School groups can block book in advance for £3/child. Other Lisburn Council business to squeeze into this post includes the fact that the minutes from the Strategic Policy Sub-committee that has been dealing with Lisburn’s 400th Anniversary Celebrations have now - as promised - been published their minutes online (though the September ones probably won’t appear until early December). But if you’re keen you can see a bit more detail about the schemes that they dreamt up proposed (and were given delegated authority to run) at their December, January, February, March, May and July. The initial budget projection of £1m was quickly cut to £330,000 on the recommendation of the Chief Executive. Following advice received from the Environmental Health Unit and given that the Mayor’s Parade had already happened, it was agreed that lapel pins not be circulated to children. The subject didn’t get mentioned in July, so it looks like the plan fell apart. Still no word about the Council agreeing to release any information publicly about the work of the Voluntary Transition Committee between Lisburn and Castlereagh councils - twenty days and counting, cough! - though Edwin Poots’ concerns about the Reform of Public Administration may put a halt to any further meetings! Though the Equality Commission did rule in October on the method Lisburn City Council used to select councillors to sit on the transition committee: a method that some felt excluded Lisburn SDLP councillor’s from participating. Slugger Political Blog of the Year ... I won! Biggest cheer of the night went to Dawn Purvis who collected MLA of the Year, with BBC Hearts and Minds' Julia Paul winning Journalist of the Year. The full list can be found on Slugger and UTV have an online video report of the main awards. I was initially surprised and bemused at this blog being nominated and then shortlisted in the the blog category. This blog was only ever intended to last for a couple of months, I was planning to stay anonymous, and the topic of politics was going to be completely avoided. So standing on stage last night as the rather surprised winner of Political Blogger of the Year, I failed all three of those targets! My thanks to Mick for his encouragement over the years, to the Commissioner for Public Appointments in NI (Felicity Huston) who sponsored the category, to those who nominated AiB and to my fellow nominees. As a local blogger who tries to remain independent and steer clear of making party political comment, I really didn't expect to win ... but am quietly chuffed. Update - And having bumped into Patrick Corrigan at the airport this morning (Tuesday) I'm reminded that not everyone has the freedom to express their opinions online. Bottom image taken by the most excellent Moochin Photoman. A quick reminder that the annual Catherwood Lecture is this Thursday night at 8pm. As a consequence of the fire at Union Theological College, the venue has switched from its Chapel to around the corner at Fitzroy Presbyterian Church. The event is free, so if the title, the whistleblowing speaker or the organisation intrigues you, feel free to pop along on the night. Paul Moore - Finance and Faith: Can Mammon and the Common Good be Reconciled? Paul Moore is the former Head of Group Regulatory Risk at HBOS and was the only senior risk and compliance executive in the UK banking sector to speak out publicly in the aftermath of the financial crisis about what he saw from the inside of a bank. Paul came came to public attention in late 2008 as a whistleblower after claiming that he had been fired for warning HBOS about its excessive risk-taking. His influential evidence given to the Treasury Select Committee in February 2009 was widely publicised in the media and led directly to the resignation of Sir James Crosby, the Deputy Chairman of the FSA. He maintained that failures in governance, risk management, compliance and regulatory supervision were at the primary causes of the banking crisis. Paul was educated at Ampleforth College, an independent school run by a Benedictine Monastery. He re-found his faith in the last ten years. This has given him the strength he needed to speak up. You can read a little more about his background or come along and hear him on Thursday 26th at 8pm. 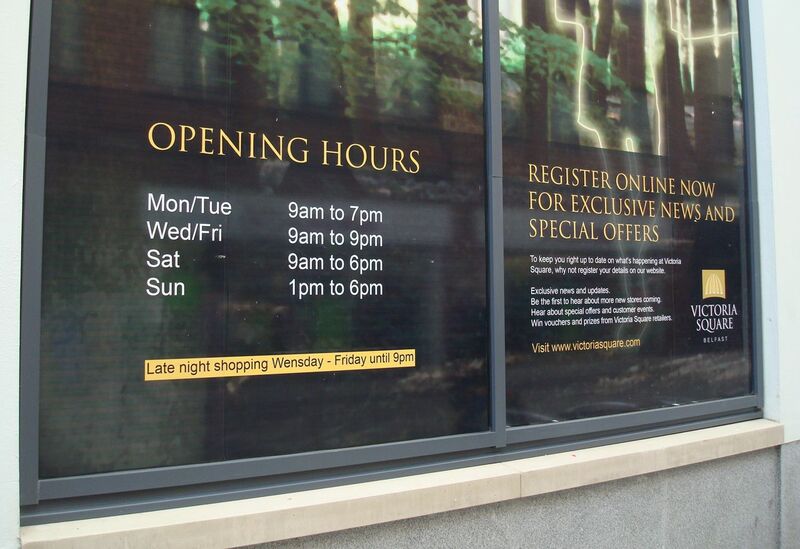 Which shopping centre in Belfast doesn't proof read its posters and window displays? Click on the photo for a clue! How is the Fermanagh flooding being reported locally? In the week that Fermanagh seems to have disappeared underwater after a month of rain, I flicked across to Fermanagh.tv to see what the region’s local video portal was saying about the flooding. Update - Tue 24 Nov - Flooding and the recent terrorist incident in Garrison have made it to the site's homepage. 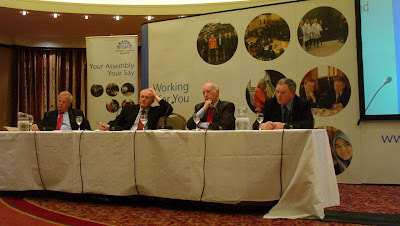 The first attempt at holding an Assembly Roadshow in East Belfast had about fifty in the audience facing Dawn Purvis, the sole MLA to turn up as the remainder of the panel stayed “up on the hill” debating the enabling Justice Bill long into the wee small hours. 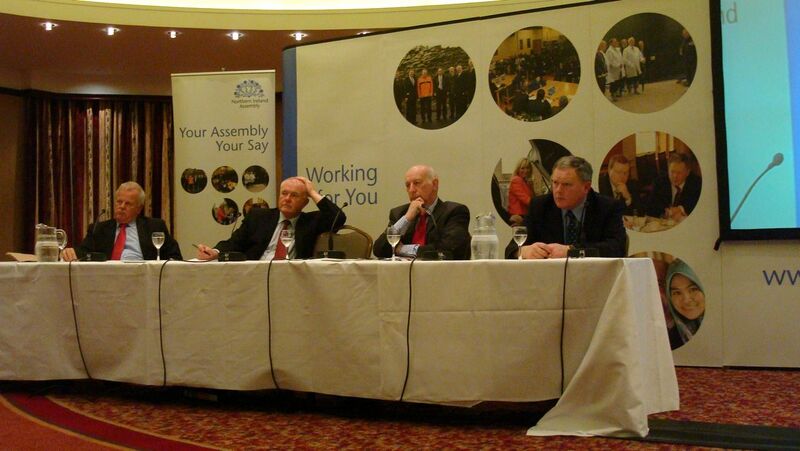 Five MLAs turned out for tonight’s return match in the Park Avenue Hotel. And while Sinn Fein’s panellist cried off, and the speaker Willie Hay the real folk missing were members of the public, with only 15-20 in attendance. “Acting as ringmaster”, Fearghal McKinney introduced the panel. Aged 46, Thomas Burns is apparently the SDLP’s youngest MLA, representing South Antrim. He was joined by the Robin Newton (DUP MLA for East Belfast and a Junior Minister), Dawn Purvis (leader of the PUP and MLA for East Belfast), David McNarry (UUP MLA for Strangford) and Trevor Lunn (Alliance MLA for Lagan Valley). Phyllis had made a long and ultimately frustrating journey to attend the previous roadshow to put her question about an ongoing issue of intimidation to Sinn Fein. She was back tonight, similarly foiled by Sinn Fein’s non-attendance – though her question was noted and a promise made to pass it on. The next substantial topic was around the effectiveness of Assembly committees. Scrutinisers without the teeth to censure ministers or veto departmental policy? Or bodies with strong role to challenge, garner consensus and influence through amendments? More charitably, he commended the scrutinising abilities of fellow panellist Dawn Purvis as well as Sinn Fein’s Mitchel McLaughlin. Confronted by the life expectancy variation along a two mile stretch of the Newtownards Road in East Belfast, Robin Newton was initially sceptical about the figures. Dawn Purvis made her apologies and left for another engagement around this time: her potential contribution was sorely missed. While the four remaining panellists could list potential ways of improving the socio-economic deficit in some areas, their answers didn’t come across as wholeheartedly grasping the injustice and scale of the problem. Next on the agenda was the issue Civil Service back pay. When would it be debated in the Assembly. During the panel’s answers, it slipped out that Civil Service Back Pay had been discussed at today’s Executive meeting, that “it was well received” with one minister voicing some concerns and had got the thumbs up. Good news for the civil servants in the audience who continued to feel the edge of McNarry’s shovel as he dug himself deeper and deeper into a hole criticising them. The panel broadly agreed that Employers for Childcare’s assertion that Northern Ireland lacked adequate provision of high quality child care. Gordon Brown had signalled his intention to phase out the childcare voucher scheme. The panel attributed the possible U-turn to electoral pragmatism and the threat of a back bench revolt. And it led to the panel questioning the Assembly’s Director General Trevor Rainey on whether the Assembly offer child care, and some discussion on whether the Civil Service should be offering on-site child care facilities. The penultimate question about who will benefit from the UUP’s link-up with the Conservatives drew an initial response of “David Cameron!” from the UUP’s David McNarry before be went on to outline the party position. Trevor Lunn quipped that it “will benefit the DUP and Alliance”. Lady Sylvia Hermon’s dog walking on the morning of the UUP conference got a mention too. And she cropped up in the final light-hearted question asking who panellists would bring with them to the jungle. Thomas Burns didn’t watch that kind of show. Robin Newton would take his wife. David McNarry offered to take Sylvia Hermon “to help her”. Trevor Lunn admitted that his wife wasn’t fond of creepie crawlies and would instead take someone like Kate Moss. So after more than twenty roadshows in 2009, the set was deconstructed for the last time. The Bangor event seemed to be the best attended with over a hundred. While tonight’s swan song in East Belfast had plenty of audience contribution and robust questioning, the cost per head of the engagement might be embarrassingly high. Yours truly joined the sofa for this week’s Blog Talk alongside Brian, Chris and Donal. (ABCD again!) The fifth episode comes in at 32 minutes long - a mere fraction of some previous episodes - and not a single mention of Twitter! We covered a wide range of topics, starting with public transport, the proposed public transport agency and the (potential) bridge across the Lagan from the Gasworks to Ormeau Park before moving onto National Museums NI purchasing Edward Carson’s ceremonial uniforms, some thinking about the current political chestnut of “community confidence” and then party conferences and how parties engage with their members and the general public. You can catch the complete series of Blog Talk over on Vimeo. And if you’d like to find out more or be involved in a future episode, contact carl at northernvisions dot org. As part of the Westlink road works, Broadway roundabout was to get a 45m tall flower erected in the middle of it. Ed Carpenter won a Belfast City Council-led commissioning competition with his expression of a post-troubles city. 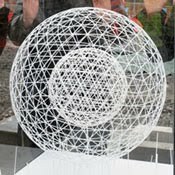 “Trillian rises over Broadway Roundabout, marking the southern entrance to Belfast, offering a symbol of transformation. Its gesture is bold and delicate, engineered and organic, familiar and extraordinary. 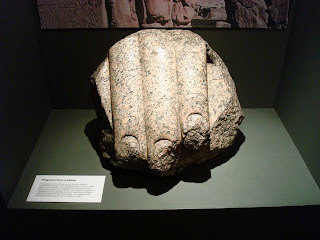 The delicacy of nature and the strength of human resolve are suggested in graceful lines and robust steel. Trillian reaches upward toward the light. Problem was that the price of steel forced a rethink, and a fresh competition. But now the replacement public art has been delayed by six months. 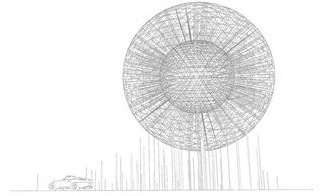 “Rise” is expected to stand 35m high, and will feature LED lighting allowing “the sculpture to glow and pulse at night”. So while the road opened ahead of time (and celebrated with an early bath! ), the public art on top of the roundabout is going to be late. For the third in this series of interviews, I talked to Dawn Purvis, MLA for East Belfast and leader of the Progressive Unionist Party in her Stormont Office on Wednesday 11 November. Read on to discover her views on East Belfast, her party and its pro-choice policy, as well as education and how she entered the world of politics. As usual I started by asking about her views of the opportunities and challenges facing the area that she represents. (Dawn) There are quite a lot of challenges. Certainly where my office is based on the Newtownards Road, would be classed as Ballymacarrett ward, which is in the top ten most deprived wards out of 566 in Northern Ireland. And that ward faces many challenges including educational underachievement, high unemployment, health inequalities, lack of development in nought to four year olds, intervention in terms of parenting skills, job and training opportunities as there’s a lot of challenges in that particular area. But there are lots of opportunities in East Belfast. Tourism potential is big. I don’t think it’s been capitalised upon and we’ve still a lot of work to do, particularly around Sirocco Quays, Titanic Quarter development, because the potential opportunities there for the greater East Belfast area not to mention the areas that are just on the periphery of Sirocco Quays and Titanic Quarter, and of course Northern Ireland wide. I think what’s disappointing at the minute is that those potential opportunities haven’t materialised very well. Whether that’s the effects of the economic recession: and we know that developers have been hardest hit by the recession. Whether that is a lack of partnership working with developers and government – for example, planning department or the Department of Employment and Learning or other smaller agencies within East Belfast – remains to be seen. To me, Titanic Quarter and Sirocco Quays seem isolated sitting on the other side of a big flyover, as well as isolated in terms of the wealth of those who could afford to live there. (Dawn) Well, I think the concerns of the communities in Inner East including Short Strand, Lower Newtownards Road, and Templemore Avenue ... have been well aired both with the Carville Group and with Titanic Quarter Developments Ltd. In terms of don’t be building a walled city or a walled village on the periphery of East Belfast to the exclusion of everyone else in East Belfast or you’re saving up problems. The communities there want to be part of the consultation around the development, want to be part of the housing in terms of the developers ensuring there is social and affordable housing but also in terms of construction jobs, apprenticeships, and latterly when the development is complete more high value jobs and a stake in that community. Because it is part of their community, it is part of East Belfast and always has been. So I think it’s important that the developers realise the linkages in geographical terms but also culturally and community terms. Which leads to a future vision of people walking to work, following the route trod by their parents and grandparents, from the bottom of the Newtownards Road across to the land that used employ so many from the area. (Dawn) And that’s why access is very, very important and I know that Titanic Quarter developments had plans for a walkover and a new road etc. But they’ve probably gone on the back burner because of the economic recession but they are no less important in the future development, the future investment in the area. That local people have access, otherwise, it just becomes a walled village, people see that there’s no opportunities for them and they’ve no connection, and no buy in with that. And building community cohesion is very, very difficult as we know at the best of times. Building social capital is very difficult at the best of times within communities that are deprived in relation to other communities. And I think it’s very important for Titanic Quarter developments, for the vision of the community they want to have in that area, it’s not just about young professionals, it’s not just about wealthy families. And Sirocco Quays is the same. They actually want a vibrant city/village community, and that means you need families, you need a mix of ages, and you need a mix of wealth as well in order to create that dynamic. I asked about Short Strand and whether Dawn saw signs of more integration with the surrounding areas. Which led to an unexpected reference to the Berlin Wall! This afternoon Littl'un took me on a tour of the recently reopened Ulster Museum. Already she's become a frequent visitor and has her favourite corners to visit. It's a bit like IKEA without the soft furnishings: white walls and a maze-like flow through the rooms. It feels like the merging of original and more modern halves of the building creates strange half floors and steps that are there to frustrate pushchairs, wheelchairs and anyone who needs to use the many chair lifts provided. And then there are the walkways that jut out high above the main atrium. I love the way that the floors are numbered 1-5 but the printed maps represent it as four floors! The architect may have been a relation of Escher. It feels like all the old art works had been hidden away in the museum store, and instead, Sean Scully's colourful blocks are adorning the walls of the galleries on the museum's upper floors. It all looks the same, until your eye detects how Scully changed his technique over time. 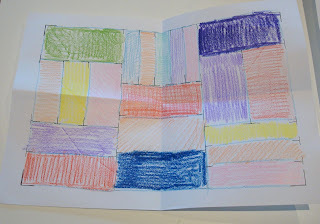 Sometimes the works are three dimensional, with coloured blocks sitting out from the rest of the picture. 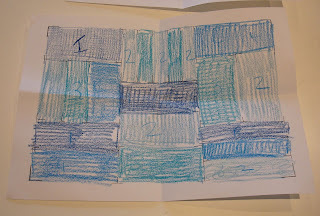 In others, he paints the blocks with coloured stripes rather than solid colour. However, as a self-confessed art-a-phobe, I'm still not convinced why hanging over sixty paintings in the same abstract style by the same artist is worth while. 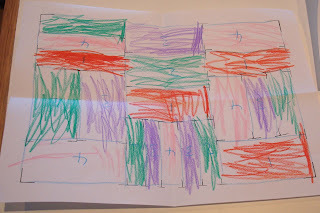 Of course, Littl'un then wanted to colour by numbers too - she was a bit bolder with her colour scheme. Takabuti was a disappointment. After the recent BBC documentary, I was expecting lots of information and displays and poster boards. Instead Littl'un led me into the smallest room on the floor, where people crowded around the glass case and gathered in front of the plasma screen to watch the short film. Why wasn't the film showing in an adjoining room with seating. Why so little space devoted to one of the museum's iconic assets? Being Saturday afternoon, the Discover Nature interactive room was heaving with people. The windows were condensated - unfortunate for those wanting to use the provided telescope and binoculars to look out at Botanic Gardens, and the low-down open window looked like an accident waiting to happen. One of my childhood memories of the Ulster Museum was the Girona display in the corner of one of the upper floors. Yet as we walked past the Girona, the magic of the old display had been replaced with wall boards and a lack of gold and glitter. The cafe's an improvement on the old top floor affair - though the restaurant prices are high, and they could do with adding bananas and a few other child-friendly, half-healthy options to feed to little people. All the same, I bet we'll be back to explore further. 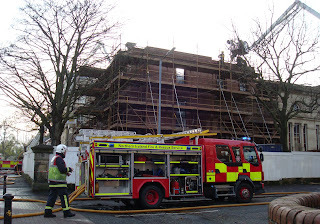 With only four weeks until the completion of the building work, this morning's fires at Union Theological College must be a real blow to their plans to expand the training they offer. UTC is the main training facility for Presbyterian ministers, but also serves theology students of all dominations studying at Queen's University. Increasingly, it also offers day and evening Christian training and youth work courses to lay people. 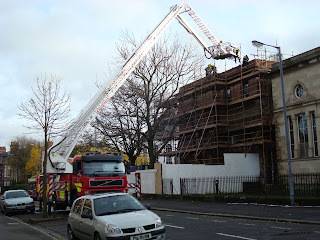 UTV and BBC news reports point to the fire service attending a blaze on the first floor around 2.30am, before returning at 7am to deal with a much larger and more sustained blaze. Interviews with college staff and the management committee talk of their "devastation" at the damage done by the fire, and their relief that there was no loss of life. While one wing has been guttted, the majority of the rest of the building is believed to be unharmed. "Two firefighters were injured by molten metal inside the premises and were given first aid at the scene. The fire is being treated as suspicious." Historically, from 1921 until 1932, the newly formed Parliament of Northern Ireland met in the building's Gamble Library while Stormont was being constructed. Does your town have the sparkle to be twinned with Disney World in Florida? Does Belfast or Lisburn have the pizzazz to be officially twinned with Walt Disney World Resort in Florida? A competition to nominate villages, towns and cities is running until 22 November 2009. Creativity is encouraged: entries can contain words, poems, pictures and even videos to convince the judges of why your home is deserving of a lasting relationship with Disney. You need to be 18 or over to enter. If you win, you’ll be invited along to a Disney-themed party in your town to celebrate the new twinning relationship before being flown out with up to another three members of your family to Walt Disney World Resort in Florida for the official twinning ceremony in the fairy tale Magic Kingdom. Katalin Varga (played by Hilda Péter) is overheard talking to her best friend, sharing a deep secret that she had bottled up inside herself for more than ten years. Word spreads and her husband hears. Disgraced and ashamed, he orders her to flee their Hungarian village along with the boy he no longer views as his son. She tells Orbán that they’re going to visit her sick mother. But Katalin is on a mission to confront the men who wronged her so violently all those years ago. She wants revenge. Up until now, she only dreamt of it. Now she needs to “pay some men a surprise visit”, driven to revisit painful places and redeem her broken marital relationship. They travel throughout the Hungarian countryside (though actually filmed in Romania) on horse and cart. First film I’ve ever seen in which a “Horse Whisperer” was credited in the closing titles! It’s a slow way to travel; the population becomes sparser; and it is clear that where the two men live ... no one would advise you travel. After “obtaining closure” (in the Spooks sense of the phrase) with the accomplice, mother and son flee, trekking on foot for the remainder of their quest. The film’s score is eerie - Nick James described it in the Observer as “anguished” - full of haunting wails that complement the grim, creepy photography. At times it felt reminiscent of the Australian film Walkabout, with the two figures walking across lush fields instead of the barren Outback. You spend a lot of time looking at the back of the characters, seeing the view that was in front of them. Finally reaching the end of her trail, Katalin is taken out in a boat by the couple she and Orbán are lodging with for a few evenings. It’s a pivotal moment as she recounts what happened ten or so years ago close to the lake. The man, Antal, sweats and the boat judders as he stops concentrating on his oar strokes. His wife is still, her face frozen, suspecting what she will later overhear in the middle of the night. A few hours later, the Antal’s pleads of “Forgive me” are not met with compassion. This is about revenge. Yet when “God’s work is done and judgement is upon you” is cried out in the final minutes of the film, revenge proves to be more destructive than Katalin imagined. I saw Katalin Varga in London’s Curzon Soho. Although pre-warned by the digital logo at the start of the film, it was pretty obvious that it was a digital “print” and wasn’t being projected from film. There was a very different visual quality. Green fields and blue skies shimmered, obviously grainy rather than being slightly blurry, while the subtitle text was super crisp. Yet there were filmic flecks of white peppering shots. Although shot on film, it had been scanned, with the subtitles added to the digital copy. The graininess detracted from the superb, moody cinematography, and it made it feel poor quality overall. Amazingly, Katalin Varga wasn’t written by a Hungarian or a Romanian. It’s an English director’s debut screenplay and film - Peter Strickland. The film’s tagline is “Revenge will set her free”. But this is no fairy story. It turns out to be a tragic tale where, no new wrongs can compensate an old wrong. There’s nothing uplifting, no jokes, no schmaltz. But the simple drama is a fascinating watch. Update on bmibaby – deliberately splitting up families and seating children out of reach? I posted ten days ago about my experience of bmibaby’s strange approach of splitting up families and allocating children seats separate from their accompanying adults. As a family, we had the experience on the way across from Belfast International to Birmingham of two adults being automatically allocated (through online check-in) seats D and E seats in one row, while Littl’un was given the C seat across the aisle in the row behind. Checking in for the way home, we experienced another variation. Cheryl got seat 15C, Littl’un was placed over the aisle in 15D and I was condemned to the back corner 24F. Another family with three children and two parents was spread across three different rows scattered throughout the aircraft. Would it be safe for a four year old to sit in the row behind her parents, or across the aisle? bmibaby responded. And here’s what they have to say. If passengers want to guarantee they sit together then they have the option to reserve their seats online prior to departure for a small fee. Alternatively a seat will always be allocated for them at check in free of charge. We have found that our customers value the benefit of being allocated a seat as this avoids any mad dash for a seat at the departure gate. If a high percentage of passengers choose to pre allocate their seats in advance of travel, this means that the remaining seats will be limited. However our staff at check in and our cabin crew will always try and accommodate passenger’s seating requirements – as highlighted in your blog post. We will ensure your comments are raised with the relevant management team. I’m not sure how “a seat will always be allocated for them at check in free of charge” sits alongside the £5/€5 non refundable airport check in charge for online passengers accessing a physical check in desk at the airport. Getting back to the fundamental issue, I suggested that it surely would not be safe if passengers actually obeyed their auto-allocated seats and allowed four year old children to be seated across the aisle or in the row in front of the adult accompanying them. Which of course is the kind of allocation that bmibaby’s check-in computer is making regularly. Should someone choose not to pre book their seats together for a small fee, our technical team have advised me that the system will automatically try and sit party members together. They also advised that they are currently working on the auto allocation functionality in order to resolve this matter and give preference to an adult / child combination. So expect to see less of this kind of thing in the future! Do leave a comment on the blog if your young family is split up … or if bmibaby manages to keep them all together. And a big thank you to bmibaby for listening and replying. So the promised follow-up post to the earlier first part of my interview with Naomi Long, Alliance party MLA for East Belfast as well as councillor for Victoria ward and – this year – Lord Mayor of Belfast. Part of this round-the-parties exercise is to open up individual and party views to a wider audience – so you get to make the judgements and figure out what you make of it all! In this section, I started by asking for her impressions of the opportunities and challenges that face East Belfast. She kicked off with some of the current changes in the area, starting with Titanic Quarter. (Naomi) ... we need to find ways of ensuring that as that huge site develops - I mean it’s the largest redevelopment site in Europe - so as we develop that we need to make sure that it is connected into East Belfast so that people in East Belfast can feel that it’s accessible to them and not closed off from them, because obviously as a former industrial site it was closed off … And we also need to make sure that is well integrated into the rest of the city, because that is going to be the future of Titanic Quarter, it’s going to be part of the city centre expanse. … we are very top heavy in terms of public sector employment ... a lot of people who find themselves in almost a double dip recession sort of situation, where having come out of the private sector recession we now face a public sector recession with potentially people losing jobs ... I think that is a major challenge for us as we try to regear the economy so we get more people out of the public sector into private sector and I suppose the question is in terms of the tightening belt for public expenditure how quickly the belt tightens because I think it is a good thing to get people out of the public sector reliance and into the private sector employment but if you try to do it now when there is no private sector employment you’re just creating a major problem. She went onto talk about the regeneration of the Newtownards Road, its connection to the city centre and keeping communities connected. (Naomi) I mean I think Belfast is in a much better shape than it was ten or fifteen years ago; but the Newtownards Road is in a much worse shape that it was ten or fifteen years ago. And we need to make sure we don’t have a sort of twin track approach to development where city centres and affluent suburbs do very well and inner city communities suffer. ... there is a lot of work being done by the local partnership board and with others ... things like living over the shops scheme, shop frontage schemes as well as public realm ... particular sites along that road which are very run down and look in very poor shape, a lot of dereliction particularly around the junction with the Albert Bridge Road and it creates a kind of social and economic precipice on the road because above it towards the Holywood Arches and beyond actually there is a reasonably vibrant kind of economic driver there around the Arches. I think allied to that we have a challenge in terms of how we deal with things around the interface, and with the very visible signs of sectarianism because I think the other thing that will influence whether people are willing to invest in a community is how stable and welcoming and open that community feels. So I think there’s a challenge in terms of trying to deal with some of the interface tensions. I’ve been up at Shankill recently doing some of their reimaging programme launches and to see the developments that have been made there is hugely encouraging and I know that there has been some work done around the Newtownards Road on some of those issues like bonfires and so on, but I think we need to start upping the pace on that because I don’t want people to walk away from that area where I grew up and choose other easier places. I would like to be able to see people in that area be able to benefit from what is happening in the city. Picking up on the mention of “the interface” I asked about her perception of Short Strand’s integration with the rest of East Belfast. (Naomi) ... there are more conversations that happen across the wall now than there would have been for a very long time. Is it more stable? I think it is. But is there still potential for violence and for things to fall apart? Yes, there clearly is and we saw that just on the August bank holiday when we ended up with rioting where a situation can escalate very quickly. In the second of the six planned interviews, on Tuesday 20 October I talked to Naomi Long, Alliance party MLA for East Belfast as well as councillor for Victoria ward and – this year – Lord Mayor of Belfast. Confident, professional, warm and with so much to say! Naomi gave wide ranging answers that were peppered with very specific examples to illustrate her points. There is no way I can reproduce the full half hour interview on the blog! A few snippets are embedded as video clips. The post length is probably my fault for going in with very open questions. This post will deal with the questions around the Alliance Party and public engagement with politics and how Naomi got into politics in the first place. And I’ve split the remaining section of the interview that deals with East Belfast issues into a second post that will appear online tomorrow. Given that we’re in the last straights before a general election, I asked Naomi about the future of the Alliance party and how it was changing and adapting. (Naomi) Well next year we’ll be forty years old, so it’s a milestone for us and I think our core message in many ways hasn’t changed in that our core message was ultimately we all need to be pulling in the same direction if we’re going to make a difference in society and we’ve kind of had that as our core theme throughout the years. Now obviously it adapts because circumstances change so where in the 1970s the issue of inward migration was a fairly peripheral issue it’s now a more significant portion of the work that we do. Religious and cultural diversity again in the 1970s was less of an issue than it is now but the central theme is that if you want society to function well everyone has to have a stake in society, everyone has to have influence over what happens, and everybody needs to be engaged and treated with respect and dignity and that has been our underlying principle right through. Clearly we’re still very focussed on issues around sectarian division and I think it is right that we should be because those sectarian divisions and indeed the levels of sectarianism, there is no evidence that that has changed. But Naomi doesn’t believe that it’ll be solved just by “throwing money at the problem”. Central government has to be listening and have a vision. (Naomi) We do need to look at how we spend government money if we’re serious with the belt tightening we’re going to be making cuts then we can’t ignore the money that is spent on segregation. We just can’t. It’s a billion pounds a year, so it’s not money that we can afford to ignore. I’m not saying you can unlock it tomorrow, you need to start looking at it in the same way you look at every part of the system and challenge it and say why are we doing … why are we providing two of this, why do we have to provide different bus services for schools that are on the same road and on the same route simply because they are wearing different uniforms or go to different churches on a Sunday, so we need to start challenging how we do business as a community and start to challenge the underlying prejudice that goes with it. (Naomi) I think that in terms of the community I would be in no doubt that education is the biggest priority out of the two. 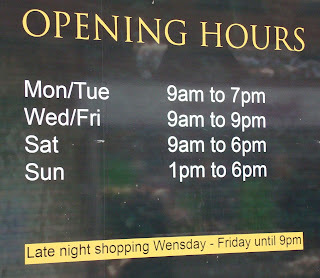 And I mean the evidence for that is fairly clear. I sit as vice chair of the OFMDFM committee in Stormont and we had a public consultation on the Policing and Justice Bill and we had no public responses. In a situation like that it is clear that you wouldn’t get that level of nil response to education. You just wouldn’t. So for the community, what matters around policing is how it is delivered on the ground. Not who runs it at the top. So I would say without doubt priority number one in terms of the community out of the two would be education. She felt that the reasons for devolving policing and justice were “not well articulated”. and they're checking the state of the cables that come out from the neighbouring telephone exchange and run under the road ... before the concrete slam is laid on top of the hole! Oh, and you can watch progress via Citigolf Belfast's webcam! A quick plug for a few events coming up at the Centre for Contemporary Christianity (their domain temporarily down) in Belfast in the coming weeks. All the events are free. In Conversation With ... Mike Wardlow - Faith in Education? On Tuesday 10 November at 7.30pm, the former Chief Executive of the NI Council for Integrated Education will back to discuss how faith collides with the education system. You can catch a recording of his June talk (synchronised with his slides) when he asked whether the Christian church had anything distinctive to bring to current local education debates and institutions? An illuminating and challenging session. The venue is the CCCI office, up on the 3rd Floor, 21 Ormeau Avenue, Belfast, BT2 8HD. Catherwood Lecture: Paul Moore - Finance and Faith: Can Mammon and the Common Good be Reconciled? The CCCI’s annual lecture is often packed out. This year, it takes place in Union Theological College on 26 November at 8pm. Update - due to the recent fire, the venue has switched to Fitzroy Presbyterian Church, only a couple of paces away from Union. You can catch Paul Moore being interviewed by Michael Burke on Radio 4’s The Choice on iPlayer (available until around 9pm on Tuesday 10 November). Tuesday 8 December, 7.30pm, 3rd Floor, 21 Ormeau Avenue, Belfast, BT2 8HD. Couldn't resist the post title! The Water Service have spent the last three or four of years tunnelling under the streets of Belfast with a giant mole to improve the quality and performance of Belfast's sewers - creating pipes large enough for Top Gear to drive electric Minis through. But this morning, a large stretch of tarmac on Cromac Street collapsed today near the junction with East Bridge Street. I first caught wind of the problems through a series of tweets from CitiGolf Belfast which got progressively more surreal! Arrived at work this morning at Citigolf Belfast to find the road outside has collapsed by about 5ft, it looks mad. Citigolf Belfast is falling into this hole.This is worrying now. This hole in the ground now looks massive. As well as hosting golf simulators that "allow you to experience the game of golf on over 57 world famous championship courses" indoor, Citigold have a wry sense of humour. There are a variety of theories to explain the collapse. The depression in the road is above a storm-water tunnel in the multi-million pound Belfast Sewers Project. NI Water staff are on site and are working closely with other utilities to secure the site, a full investigation is under way to determine the cause of the road depression." "NI Water will commence repairs as soon as possible. "NI Water would like to apologise for any inconvenience caused to the public. On the other hand, Belfast Sleech could be to blame. 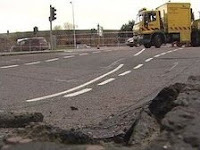 Roads Service spokesman Colin Brown said the city is built upon a deposit of soft clay, silt and mud known as "Belfast Sleech". "Periodically we can get voids forming under the roads," he said. "Sometimes it's very clear what has caused it, other times it's quite a mystery." The one definite fact about the collapse is that it will not be fixed overnight and will cause traffic problems on Monday. Translink have already diverted Metro and Ulsterbus services around the area, while the BBC report that "an emergency meeting will be held on Sunday to discuss the potential traffic disruption in the city centre." Update - Now reckoned to be caused by an underground air bubble disturbed by the sewer work last year and finally rose to the surface. Only one week of traffic chaos predicted! 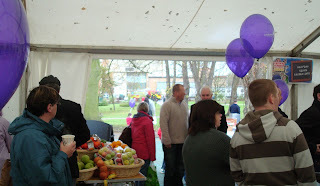 Lisburn City Council have been running a monthly Farmer's Market up in Castle Gardens for the best part of a year now. Once a month, a white marquee is erected, small traders sell their produce, and a donkey and cart give people rides around the gardens. It's a cold, breezy spot - but other than the cramped Lisburn Square, it's probably the only space Lisburn has to host it. To be honest, there aren't many stalls selling farm produce. From memory, this morning's traders seemed to offer tempting potato farls, sweets, jewellery, and of course, Bean and Gone's fine coffee (and tea). After the ructions earlier in the year, and the market organiser's determination that there was only room for one stall of each kind, it was a little surprising to see a second coffee stall set up at the tent's entrance. The great thing today was that there were activities for children on offer. So Littl'un and I got to make a paper boat, decorate it, and then float it in the fountain. Fifteen minutes later - after a cup of tea and an impromptu Open Coffee Lisburn meet up - the wee purple boat was still bobbing along, being blown by the breeze across the water. 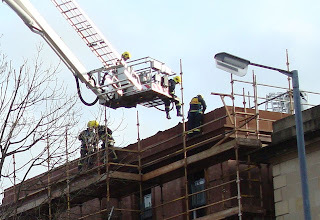 Lisburn can't afford another fire! I've twice rung the estate agent that manages the house we're renting to ask to extend the lease. First time he forgot to ask the owners! I called in the office this morning to ask if there was any progress ... but he still hadn't made contact with them. So he called the owners there and then, and inside thirty seconds had the positive answer we'd been waiting to hear for a month. Not much use employing an agent to rent out your house when they don't pass on messages. Finally out to Sainsburys at Sprucefield. Innocent's Great Knit has extended this year from bobble hats on bottles of smoothies to big hats and wraparound scarves for their tubs. A fine festive tradition. 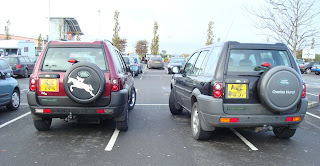 And example of why people driving 4x4s and expensive cars should be given parking lessons before being allowed out on the road! Belfast got its very own Monopoly board today with the launch of the latest city edition in the Waterfront Hall. A Northern Ireland edition was brought out about ten years ago, but eighteen months ago, the makers returned to Belfast to consult with tourist organisations, the media and local people to come up with a short list of locations. 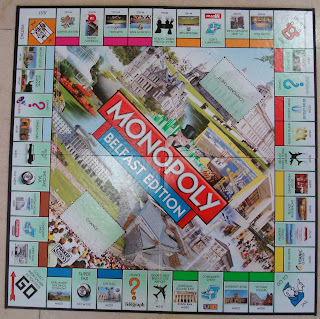 Mark Marriott, the creator of the Belfast board for Winning Moves Ltd, insisted that in a world of computer games and on-screen entertainment, there was still a place for board games in homes - both locally and also with ex-pats. He’d better be right, otherwise the Belfast edition will gather dust in Belfast city centre retail outlets and Amazon’s warehouse. Asked about the significance of the value of different sites, Marriott said that “we don’t try to rank them too much”. So don’t expect deprivation to be marked out on the cheapest brown sites (Linen Hall Library and Custom House Square take those spots). And the Malone Road doesn’t feature in the high value blue sites. Instead the City Hall comes in at M350 (“M” being the Monopoly money currency) and the top spot at M400 goes to Parliament Buildings Stormont! While the landmarks have changed, the rules are standard and the player tokens are familiar. They didn’t take the opportunity to swap the top hat for a bowler hat! In fact, despite playing down the sensitivities, it is clear that the Belfast board creator steered well clear of potential controversy. Later, Marriott added that it was about “unification not polarisation”. When challenged why well known landmarks like the Falls Road and Shankill Road were missing, he played down the omission, saying that people hadn’t really asked for those locations. With our local diversity of sporting pursuits, a single colour wasn’t sufficient to accommodate everything, so while the pinky/purple spots are taken by Belfast Giants, Ravenhill and Casement Park, Windsor Park sneaks onto the neighbouring orange spaces, along with the Ulster Hall and the CS Lewis Centenary Statue at Holywood Arches. Local commercial media outlets got to sponsor the Chance and Community Chest spots, which will help enormously with publicising the Belfast board’s launch. Disappointingly, Free Parking isn’t sponsored by NCP! So there were top hats, giant dice, tossing money in the air, and much lying on the floor to get a good angle.